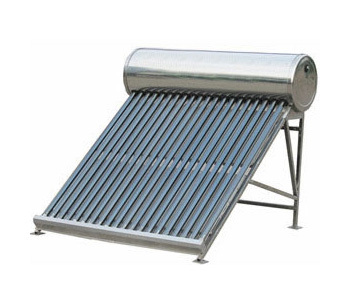 If there is one renewable energy solution that can be safely recommended at present, it is solar water heating. There is one condition though: keep it simple. Lots of complex system exist to pump water around, to place the water tank below the roof or to retrofit your existing geyser, but these solutions only bring additional costs and reliability issues. In the end, a simple passive collector with vacuum tubes connected directly to the water tank is all that is needed. First of all, at the risk of sounding like a bit engineer-like, everyone should know that solar hot water respects the second law of thermodynamics. Basically, this law causes useful energy to be lost to heat every time that it is concentrated or converted from one form to another. For example, traditional water heaters use electricity which was converted from coal or gas at a 40-60% efficiency in large powerplants operating at very high temperatures. Solar water heaters, on the other hand, only concentrate the heat from the sun a little bit in order to heat up water to the temperatures that you require. This fundamental respect for the laws of nature together with the simplicity of a passive solar water heater leads directly to the second point: solar water heating is attractively cheap. When compared to solar PV, a simple passive solar water heating system would typically cost you about 4 times less per unit of electricity saved. Finally, solar water heating mostly avoids the primary problem hampering solar PV: intermittent output. Because the geyser storing the hot water is well insulated, it can effectively store in the heat that was collected from the sun over a long period. In comparison to solar PV therefore, solar hot water not only serves its purpose when the sun is shining, but also after the sun has set. Naturally, solar hot water will work a lot better in hot and sunny places than in cold and cloudy places. After a hot sunny day, solar water heater will typically still offer a burning hot water for your early morning shower. For a cold cloudy day, however, the electric heating element built into the solar water heater will be required if you want to shower in the morning. Solar water heating is also an excellent poverty alleviation mechanism. It is cheap and simple, does not need any connection to the electrical grid, and most poor people live in hot climates which are well suited for solar water heating. Hot water might sound rather simplistic, but a simple hot shower can add great hygienic benefits and the boiling temperatures reached in the geyser can even be used for sterilizing drinking water. Yes, solar water heating cannot solve our energy problems, but it can certainly make a contribution. Water heating typically consumes about 40% of the average household’s electricity usage and millions of households cutting most of this sizable component can certainly make a significant contribution to the big picture. So, if you live in a reasonably sunny location, please consider spending a few minutes on the Internet, finding a certified hot water heater installer, and getting one of these elegantly simple pieces of engineering on your roof. It is a great way to simultaneously save money and save the environment.